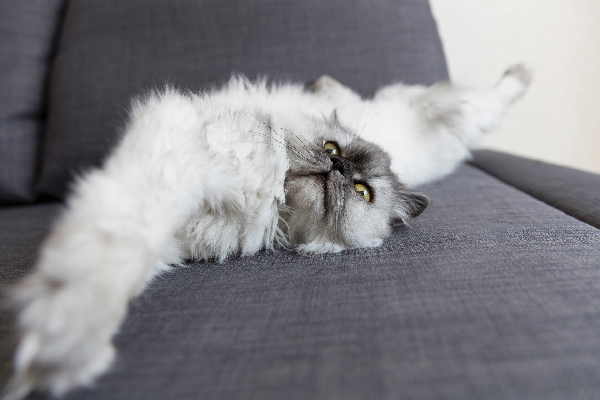 Cats spend a lot of time cleaning themselves, but did you know how much they do it and why? Adult cats spend about half their waking hours grooming themselves and their kitty friends, so it must be pretty darn important to them. But did you know why cats groom — other than to polish their beautiful fur, of course — and what different types of grooming they do? Here are some basic facts. First we’ll start with the how. 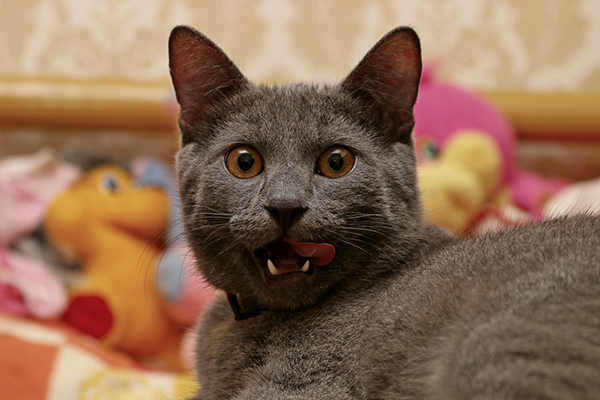 Cats’ tongues are covered with tiny barbs called papillae. When a cat licks herself, she not only gets dust off her coat but she pulls out any loose hairs as well. 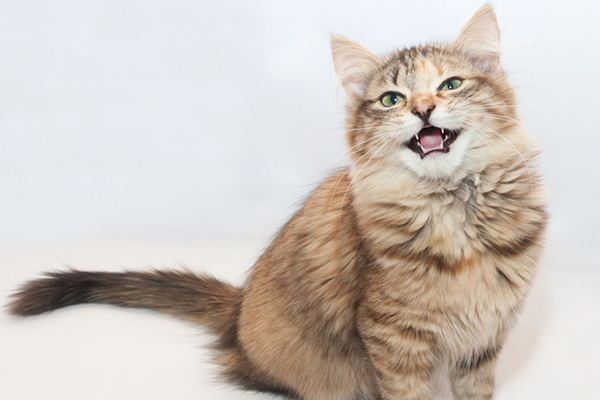 Cats use their tiny front teeth to remove fleas and ticks, work mats out of their fur, and remove plant material stuck deeper in their fur than their tongues can reach. They chew on their claws with their back teeth to remove worn claw husks and replace them with sharp, new daggers. Now, moving on to the why, here are some of the reasons why cats groom themselves. 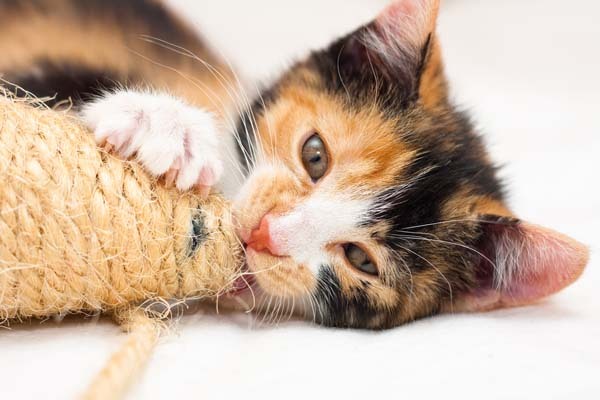 Not only do cats want to remove dust, plant material, and other grunge, but because they’re predators as well as prey they want to remove all smells that make predators aware of them. That means cleaning any residue of food (whether it’s kibble or a fresh-caught mouse) from their fur. Grooming serves to move the natural oils secreted by the cat’s skin into and evenly around the fur, keeping it shiny and in good condition. Those oils also guard against dampness and excessive cold. 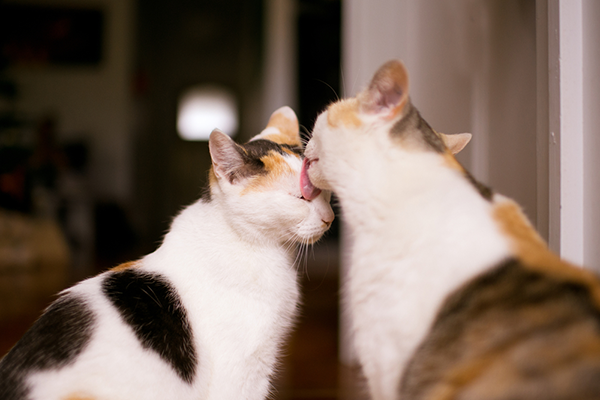 Kittens start grooming one another — a behavior called allogrooming — by the time they’re five weeks old. Sometimes this behavior continues into adulthood, with bonded cats spending time grooming the places that are hard to reach by themselves. My cats, Thomas and Bella, are champion allogroomers. 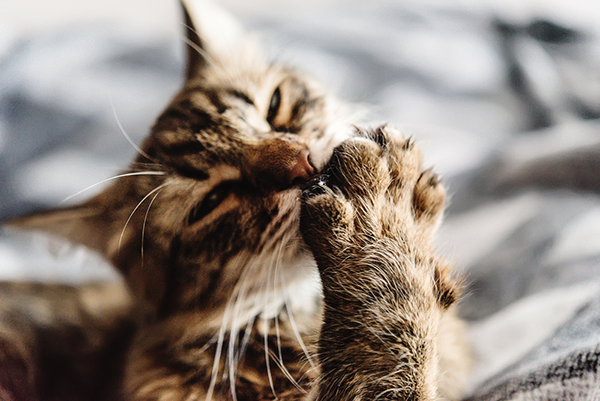 You’ve probably seen a cat start grooming herself after an embarrassing moment like falling off a counter. This is called a displacement behavior, and it relieves the stress caused by that momentary lapse of poise and grace. If a cat is severely stressed, she could resort to overgrooming or “barbering” her fur in an attempt to feel better. 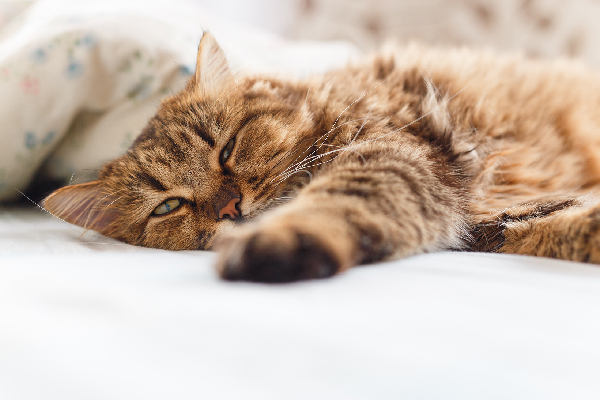 Although they have some sweat glands in their paws, cats don’t sweat like we do when it gets too hot. By dampening their fur with saliva, cats help themselves to cool down when the weather is extra-warm. One more thing to keep in mind: A cat who stops grooming is a cat in trouble. She’s either ill or severely depressed. If your cat isn’t grooming herself, it’s time for a trip to the vet. Do you have any other questions about feline grooming? Ask away in the comments and I’ll answer your questions.